About 4.1 billion years ago, our solar system was a huge cluster of comets bombarding every planet orbiting the Sun and crashing into each other. 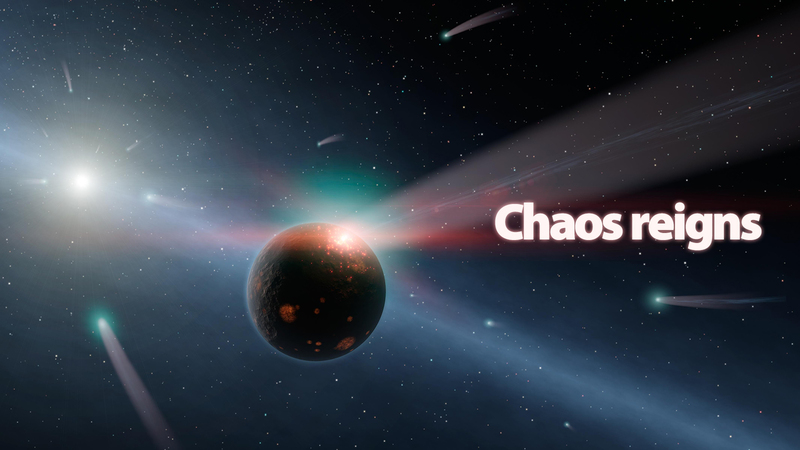 That period of chaos is known as the Late Heavy Bombardment, and astronomers believe it was key to the formation of life in our planet. For the first time ever, scientists using NASA's Spitzer Space Telescope have found a star system in which this is happening right now — just around the corner. It is called Eta Corvi. Located just 59 light years away from us, it's 40 per cent more massive than the Sun but much younger. The star is surrounded by two debris disks. In the outer disk — which is orbiting around 150 astronomical units from the solar system's centre — comets keep crashing onto each other and into rocky bodies in a seemingly never ending dance of planetary mayhem. The collisions break these objects into smaller pieces, which will keep striking each other until they turn to dust. Spitzer's infrared detectors got evidence of this insane havoc for the first time in history, showing comets smashing onto a rocky planet and being "shred to pieces." The telescope detected the signatures of water ice, organic material and rock, which are believed to be the seeds of life on Earth. This process happened in our solar system when it was 600 to 800 million years of age. Eta Corvi is around that age too. The comets that bombarded Earth are believed to be the harbingers of life, adding the water and organic molecules that combined to form organisms in our rocky planet. A glowing red flash captures the moment of impact on the planet. Yellow-white Eta Corvi is shown to the left, with still more comets streaming toward it. During the Late Heavy Bombardment, our solar system suffered the same fate, with bigger outer planets migrating to their current orbits and, in the process, slinging ice comets onto the rocky planets in the inner part of the solar system. Our moon got most of its scars during this project.